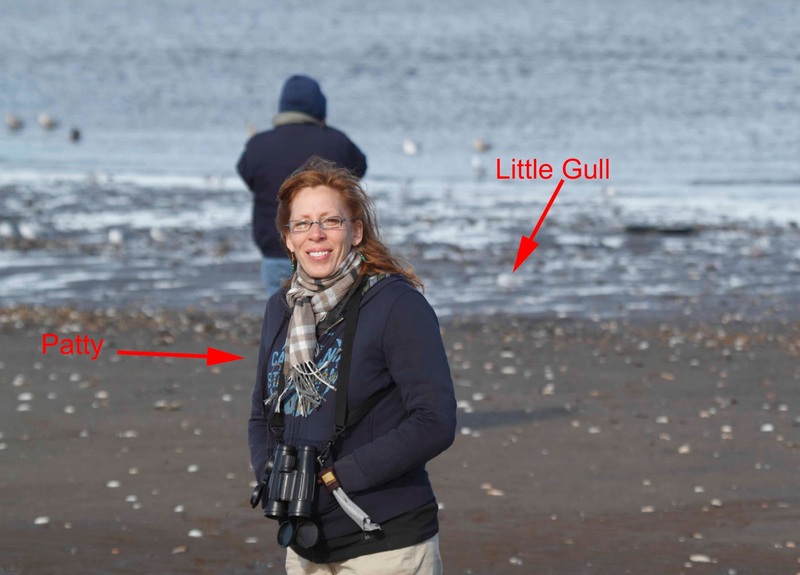 Patty and I headed to north Jersey yesterday after work in search of a Black-headed Gull which has been seen at the Raritan Bay for the past 2 weeks. In order to get to the mud flats, we had to cross railroad tracks and walk through a dumping ground out to the beach. 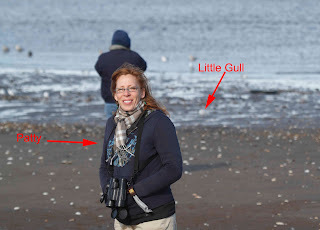 We arrived to find 2 other birders looking through a scope at the gulls, so we knew we were in the right place. As soon as we approached, I was reprimanded by one of the birders for bringing the dog with me - "If you want to make friends with birders, don't bring a dog with you" - nice way to meet someone. 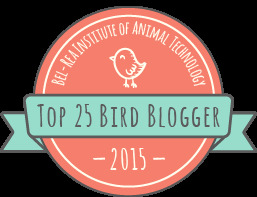 Anyway, I explained that Roxy has never scared a bird away, blah, blah, blah. 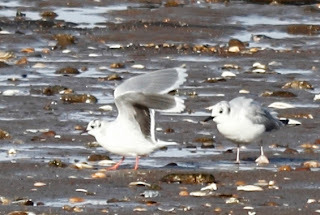 He warmed up after a few minutes and viola - showed us an adult Little Gull which is a life bird for me. I know that it isn't much to look at for non-birders, but I think it's adorable. It is so short that it waddles when it walks along the mud flat. ID for this gull is relatively easy for good birders like the guy who pointed it out to us. The first indicator is that it is well, little - not as tall as the Bonaparte's gull which is shown in the photo below. Other obvious field marks are that the wing tips are not black like Bonaparte's and the wing is dark underneath - both of which you can see in the photo below. When the wing is folded, the wing tips appear to be serrated which can be seen in the photo above. The same guy who scolded me about bringing a dog to the beach is shown in the photo below walking right up to the gull. For the most part, the gulls didn't seem to mind him mozying up to them (they didn't mind the dog at all either). The gull eventually flew but not before I snapped this photo of Patty freezing her hands off on the beach. I never got a very good photo of the gull since I was standing back up on the beach so as not to scare off the gulls with the dog. 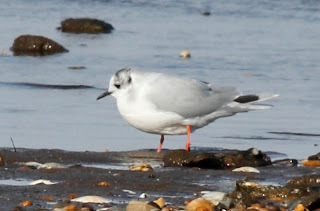 We never did get to see our target bird which was Black-headed Gull, but hopefully I'll get to see one this weekend at a closer location. While we were up in north Jersey, we decided to go to Carteret to see a Monk Parakeet. 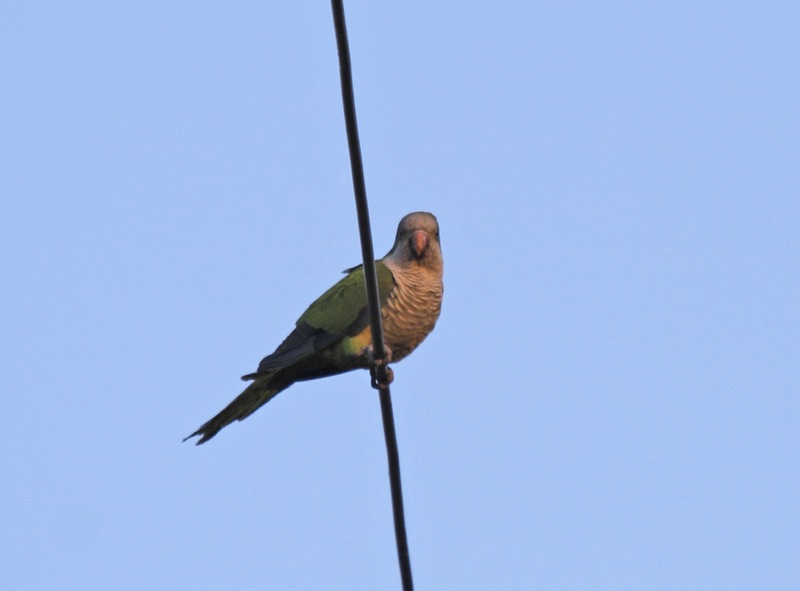 The Monk Parakeets have colonized in this town and build big bushy nests on the telephone poles right in the center of town. Here is one sitting on the wire looking at the crazy ladies on the sidewalk.